With General O'Neill's reassignment, General Hank Landry has taken command of the SGC, and SG-1 has been disbanded as Teal'c works to build the new Jaffa nation, Carter has taken a research position at Area 51, and Daniel prepares to depart for Atlantis. Lieutenant Colonel Cameron Mitchell arrives at the facility, having been promised his choice of position following his arduous recovery from wounds received during the dogfight over Antarctica, and he asks to join SG-1. He is disappointed by the news that he will instead lead a newly formed SG-1, and he makes it his goal to reunite the flagship team. Daniel's departure for Atlantis is delayed by the arrival of Vala Mal Doran, who seeks his help in translating a tablet that promises Ancient treasures hidden on Earth. However, she has also brought a pair of kor mak bracelets which bind the wearers physiologically, and to guarantee her fair share of the treasure she slips them on herself and Daniel. Unable to be separated from Vala for any length of time without risking death, Daniel must find the Ancient treasure, and his translation of the tablet reveals the legend of Avalon. Merlin was an Ancient, and his treasure may be buried under Glastonbury Tor in England. From Prometheus in orbit, Mitchell, Teal'c, Daniel, and Vala beam into a previously undiscovered cavern deep beneath Glastonbury Tor. There they find a sword mounted in a stone, and a holographic image of Merlin delivers a cryptic message, "Prove ye worthy, and all will be revealed." Unable to draw the sword from the stone, the team separates to search for clues. Vala follows Daniel as Mitchell joins Teal'c, and in two separate caves they discover the tests that will determine their worthiness. Sealed within the chambers, they struggle to solve the Ancient riddles as the ceiling begins to lower, threatening to crush them alive. With only moments to spare, Daniel and Mitchell solve the Ancient riddles that release them from the collapsing caves, and Mitchell successfully draws the sword from the stone, hoping that the Ancient mystery will be revealed. Instead, a holographic knight appears and engages Mitchell in mortal battle. Only after defeating the chamber's guardian and returning the sword to the stone does the vast treasure miraculously appear. Among the riches is an Ancient communication terminal and an Ancient text which tells the story of the Alterans, a race from a distant galaxy who made their home on Earth. Convinced that the Alterans were the ancestors of the Ancients, Daniel urges General Landry to activate the communication device to seek out the distant galaxy where Alterans may yet exist. Still linked by the kor mak bracelets, Daniel and Vala activate the device and immediately collapse as their consciousness spans the galaxies, and they find themselves inhabiting the bodies of a young couple living in a medieval village on a distant world. As their bodies remain unconscious at the SGC, Daniel and Vala must pretend to take on the identities of Harrid and Sallis, unable to access their thoughts or to communicate with Earth. Daniel and Vala learn that the village of Ver Ager is one of many ruled by the Ori, an ancient and powerful race that demands blind obedience and worship, but Harrid and Sallis and their friend Fannis have come to question the religion of Origin and are suspected of heresy, a crime punishable by death. Indeed, when Vala is accused as an unbeliever, she is sentenced to be burned alive at the village altar, and Daniel watches in helpless horror as the flames consume her. Suddenly an enigmatic figure appears, a ghostly Prior of the Ori, whose glowing staff restores Vala to life as he bids Daniel and Vala to follow him. This episode aired in two parts. SG-1 disbanded when O'Neill left, Carter went to R&D at Area 51, Daniel requested reassignment to Atlantis, and Teal'c left the program to help build the new Jaffa nation on Dakara. Lieutenant Colonel Cameron Mitchell led the dogfight over Antarctica in the battle against Anubis, for which he was awarded the Congressional Medal of Honor. His goal is to reunite SG-1. Technician has been promoted to Chief Master Sergeant Walter Harriman. Vala's full name is Vala Mal Doran. 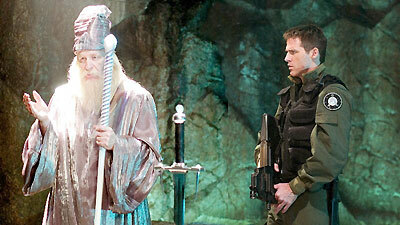 Myrddin (Merlin) was among the Ancients who left Atlantis and returned to Earth thousands of years ago. According to legend, King Arthur was carried off in a barge by Merlin, headed for the Vale of Avalon, which was a magical place where the dead would meet, suggesting that Arthur never actually died but would in fact one day return. Avalon may be a place where Merlin helped Arthur, a mortal, ascend. In 1191 the monks at Glastonbury Abbey claimed to have found the grave of King Arthur with the inscription: "Hic iacet sepultus inclitus Rex Artuius in insula Avallonis" ("Here lies the famous King Arthur, buried on the Isle of Avalon"). Vala describes the Goa'uld kor mak bracelets as having been the ceremonial marriage bracelets of the Egyptian sky goddess Nut. Once upon a time, there was a race of people that went on a great journey through space, across the universe. They were called the Altera. After much time, probably thousands of years, they found a great belt of stars. The Alterans named their new home Avalon, and they built many astria porta. The Ancients were originally the Alterans, who came to Earth from another galaxy, left our galaxy for Pegasus, and returned later when they lost the war to the Wraith. Did I mention I'm on a mission from God? You ever get a bad feeling about something?